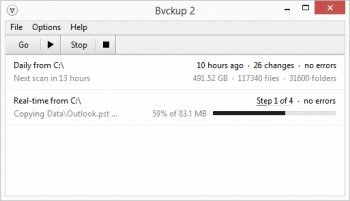 Bvckup is data backup software that makes a reserved copy of specified files and folders and maintains it in the perfect sync with the original. In real-time, on schedule or manually. Small and very lean with a very fast delta copier, excellent user interface, device tracking, shadow copying, move detection, run-as-a-service mode, intelligent and discrete update mechanism. Today - May 19th 2014 - the app has been released to the production and so it moved from being free beta to trail-based paid software status. Free betas still remain available for download and the beta line will still be receiving maintenance patches, so it's an option for those who prefer to use the app for free. Betas however are not eligible for tech support. This entry is for Beta releases of Bvckup 2. These are freeware and they will remain free and publicly available after the production release. Once the program is released to the production, it will in fact be paid software, but it will also get a separate entry on BetaNews. Also, the "truly free" version of Bvckup you are referring to is free for the exact same reason - because it's beta! Just went to their site. This is just a PUBLIC beta. Bvckup is NO LONGER actually free. If you want to use it for Home, it is $20. I still have the last release of the v1, so I will stick with it as it was TRULY FREE. FileForum really need to change the category for this, it NOT freeware anymore.